Delphinium is about 80% finished. I have most of it written out, I just need to connect the last pieces together and have it make sense. A few new characters keep popping in here and there as well, so I have to manage how I introduce them and if they get any significant page-time. Also trying to juggle a few new points of view, but I think those will really only be significantly implemented in book 3. For now it’s by far mostly Pierre, Lizzy, and then a few other characters getting a ‘cameo’ scene. Delphinium has 38 chapters. Part 1 consists of chapters 1-21, and is 90% done. Chapters 1-10 are ready to be sent to betas. I’m fixing up / adding onto chapters 11-21 and when that’s done I’ll send it out to said betas. I thought about sending out 1-10 already, but splitting it into 1/4ths just seemed like too much even for me. Chapters 22-38 are less done, but still have everything plotted out already. I know where it’s all going, the end, and it wraps up nicely with no major cliffhanger. I’ll get on writing more in those chapters after I send the first half out to be read. Oh, and the total wordcount will be around 110,000 words (each chapter is going to be about 3000 words, but lengths vary). For comparison Larkspur was only 15,000. I want to make this book the best it can be, and really showcase my writing and the realm of Clandestina in a way that Larkspur only hinted at. 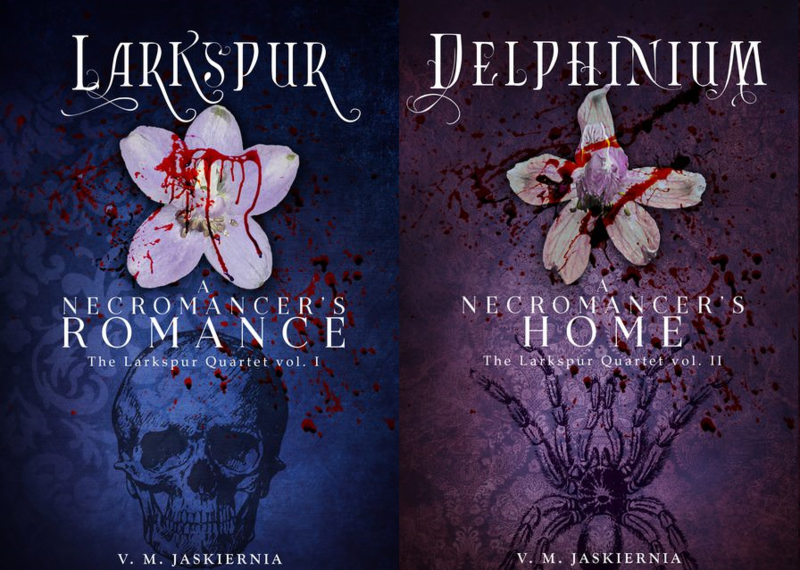 Honestly there’s so much I didn’t know about Clandestina or my characters when I was writing Larkspur, much of this is a surprise and an exploration of the world for me as for you. I thought about putting it up for pre-order again. It just hit me that it’s been a year since I put it up for pre-order the first time. A lot has happened to me in that time, a lot has changed for me, and with my writing and the story. I just found a new character and his family last week even! But I realized that while the pre-order copies sold were awesome and the pressure helped me a bit, it did not pan out well last time. And the last thing I want it to tempt fate and try it again only to have it all go bananas. So instead I’m making myself accountable by writing this and being open.